St Clare Hospice CEO, Sarah Thompson, outlines 5 tips on how her career in Fundraising prepared her to become a first-time charity Chief Exec. But, I guess I’ve had good training; I’ve been lucky enough to work with some of the best hospice clinicians and thinkers in my twelve years in the hospice sector. Also, I’ve been a fundraiser, which means I believe I’ve got many of the skills I think you need to end up as a charity Chief Exec. Much of my job as CEO is about building relationships with people. This could be anyone; staff, the 500 or so volunteers who support the hospice, patients, families, funders and the local community. You can’t be a good fundraiser – or a good CEO – if you don’t understand the importance of investing in relationships. It’s the relationships with staff across the hospice which has been most important to get right. When I can, I have lunch in the hospice dining room, sitting with different people each time. From the housekeepers to the doctors, and everyone in between. It’s amazing what you pick up about what matters to the people who work for you over a cheese sandwich! I think it’s really important to walk the floor regularly – and slowly – so that staff know they can chat to you about what’s on their mind. This way, a lot of small issues get sorted quickly, before they become bigger problems. Fundraisers learn to communicate with clarity, usually through storytelling, to help people understand the cause. Staff and volunteers want clarity on what the organisation stands for and what you’re all trying to achieve. I know myself how demoralising it is when you work for an organisation that doesn’t communicate where it’s going or what the goals are. You lose your motivation to work hard, along with your sense of self-worth. People need to know how their jobs fit into the jigsaw. This gives them a sense of purpose in knowing they’re contributing. Thus, I’ve found it important to define a simple and clear vision – and communicating it regularly in both formal and informal ways. As a CEO, I also worked out quite quickly that people are trying to decide what you think about all manner of things, even if you don’t use any words. Your spoken/written opinion or even your silence on matters, are being scrutinised for meaning and for approval. Fundraising is about telling stories and presenting business cases in order to secure buy-in and funding. I’m a great believer that good fundraisers understand the nuts and bolts of the service delivery,as well as the numbers and the impact, in order to be able to tell those stories. However, I have seen many a senior fundraiser sitting with a glaze forming over their eyes when IT, plumbing or clinical performance statistics are discussed. I know those are the fundraisers who’ll be unlikely to want to go further in their careers. Although I will never be an expert in how you develop nursing competency frameworks; will probably never know how the emergency generator switches on if the power goes off; and am not entirely sure of the detailed processes involved in our payroll; I do need to know which questions to ask to ensure we’re a safe and well-led organisation. I need to be able to identify our weaknesses, and to know if we’re financially viable. Most importantly, I need to know what kind of answers I should be expecting back from the people I employ to do this stuff. I cannot hope to know everything about how a complex organisation works. An organisation that employs some 140 staff and has 500 volunteers. I know my own foibles and weaknesses, so thankfully one thing I’m very good at is hiring great people who are strong in those areas; the people the organisation really needs. I remember some ten years ago being involved in a conversation around the sorts of people who could be considered to be a charity Chief Executive. I remember being riled by those who dismissed Fundraisers as ‘too flaky,’ ‘too concerned about money’ or ‘they don’t really understand the service side of things’. Indeed, one year ago, there certainly were murmurs about me arriving at St Clare, including, “the place will fall apart under a fundraiser”. Actually, so far we’re doing fine. In fact, I’m very proud of the positive changes we’ve made here at St Clare to make it a better place to work, and a good hospice that supports and provides 24/7 care for those facing one of the most difficult times in their lives. Yes – we have a lot to do to reach more people who need end of life care, but I feel very clear about how we’re going to do it – and I think my staff are clear, too! 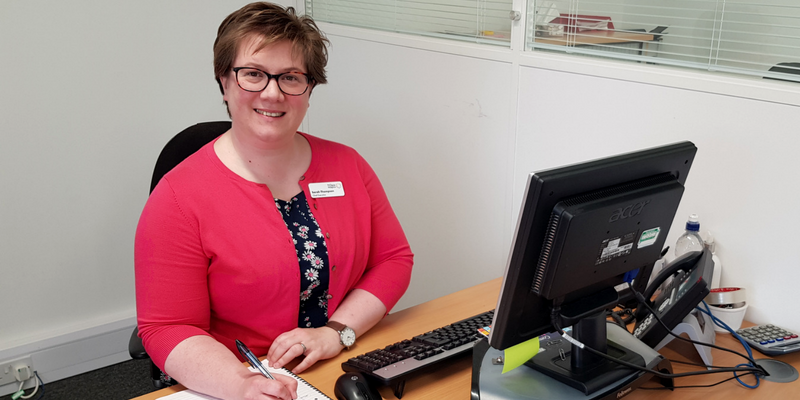 Prior to St Clare, Sarah was part of the Senior Management Team at St Joseph’s Hospice in Hackney for four years and before that, she was Director of Fundraising at the Hospice of St Francis in Berkhamsted, Hertfordshire for seven years. She has significant experience in strategic development and growth of hospices, community engagement work (including responsibility for the award-winning Compassionate Neighbours project in East London) and securing significant income. She completed an MSc in Voluntary Sector Management, graduating with distinction in 2013. She is also a very proud mum of two young sons (9 and 6).